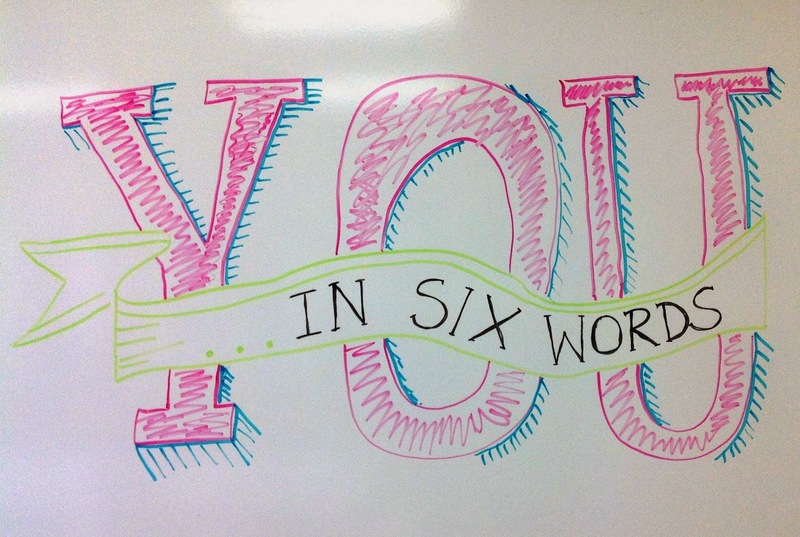 What's Your 6 Word Memoir? This is what I had on my bulletin board when the students came into Lunch Bunch today. ( I copied it from this pin on Pinterest.) 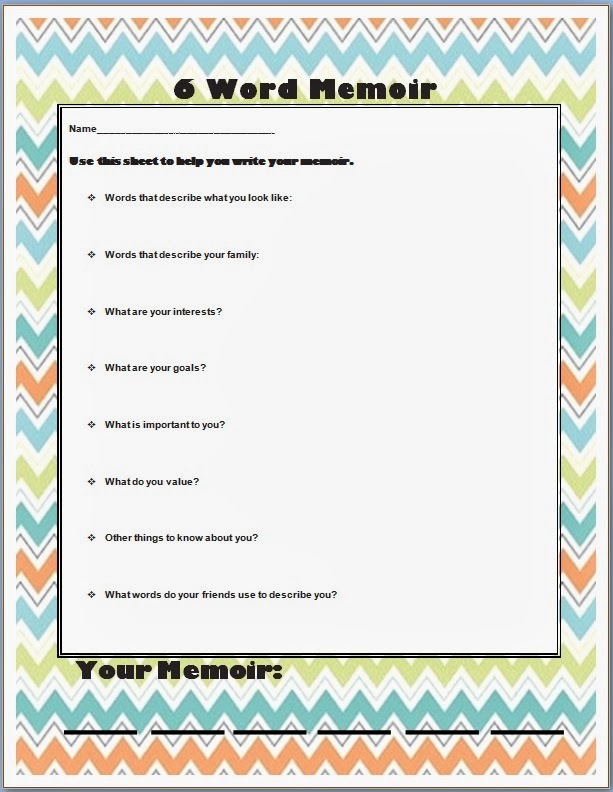 I know that they have been writing memoirs in ELA and our video project that we having been working on for weeks is at the point where I only need to see a few students at a time, so I knew it was time to move on to something new. I have been thinking of having the kids describe themselves in 6 words since break, when the 6 word memoir idea was being bounced all over Pinterest, Twitter, and Facebook. There was a lot of discussion as they sat down with their lunch about "You in six words." "Impossible" was the phrase I think I heard most of. As they ate their lunch, I read them Ernest Hemingway's 6 word novel, that started it all. We talked about what that might mean and how might people interpret it. Afterwards I showed them a Haiku Deck with some sample 6 word memoirs. I then asked them to write me own 6 word memoir. Before I collected their memoirs, I asked them how what we did today tied into our work with kindness and ending bullying. Basically we want others to think of us in a way that shows we care about others, that we are not afraid to take a stand, that we are proud of who we are, and that we respect each other's differences. All I can say is, "Good work girls!" I collected the memoirs at the end of Lunch Bunch and I have put together this Haiku Deck presentation that I will share with them when we gather back together next week. 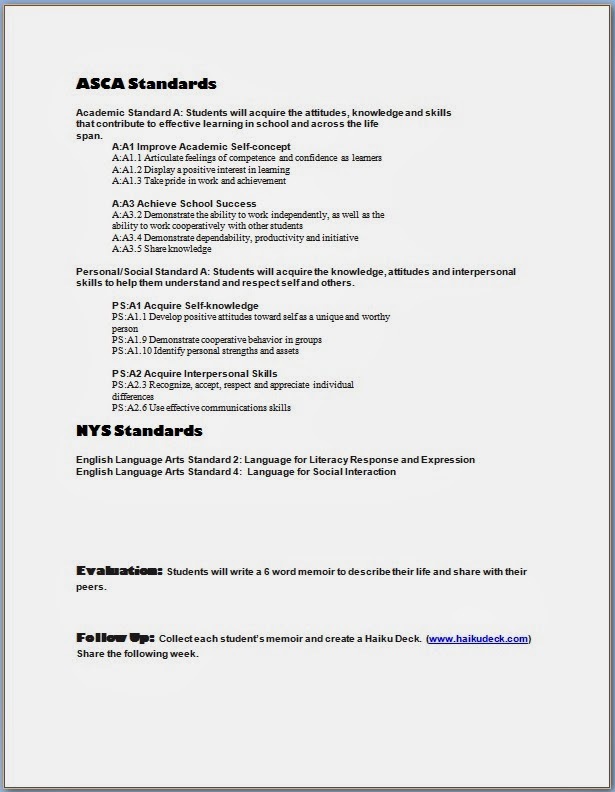 I even have this lesson linked to both ASCA and NY Standards.